Admiralty Gate is the perfect base for exploring the many wonderful attractions in Medway and Kent and also for excursions to London - only a 45 minute train ride away. The flat is quick and easy to get to, handy to the M2-M25 and with 4 railway stations within 10 minutes and a bus stop outside. 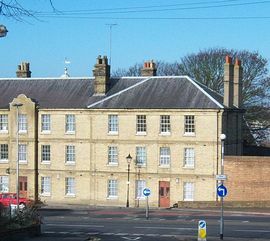 This historic building forms part of the perimeter to the Historic Dockyard, Chatham, so one of Kent's biggest tourist attractions is on your door-step! Within easy walking distance is Chatham Maritime with the Dickens Centre, Dockside factory outlet shopping centre, cinema complex, restaurants and marina. Historic Rochester, with it's Norman Castle and Cathedral and Dickensian fame is only a 5 minute drive. However the flat has more to offer than excellent location, it works really well - for families or small groups. It is clean, light and spacious with central heating. There are 3 bedrooms, 2 double rooms and 1 single. The double rooms are large and can easily fit a travel cot and or fold-out bed, if you have little ones you would like in the same room. 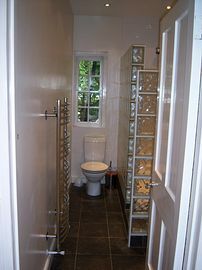 The bathroom has a modern fit-out including glass tiled walk-in multi-jet shower - no bath. Whilst there are lots of options locally for eating out if you want dinner or perhaps a big breakfast at home its no problem, the fully equipped fitted kitchen includes underbench fridge and freezer, built-in microwave, electric cooker and gas hob. 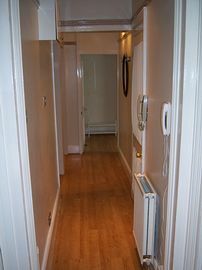 The adjoining utility has airing cupboard, washing machine and drier. 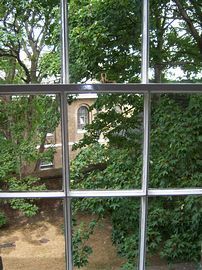 Large picture sash windows at the back look onto the walled garden, the Historic Dockyard and the River Medway. You are welcome to use the garden, it is big and good for play or a bit of sun bathing. At night the building is quiet. There is also a TV with digibox, a wireless broadband connection for your unlimited use and a telephone package with free calls to 01 and 02 UK landlines and many international countries. It is a security building with intercom access. No. 11 is a first floor flat, up one flight of stairs - there is no lift. Please let us know if you have any special requests or if we can help make your stay better. Excellent base for Medway, Kent, London and the Coast. Home comforts, from wireless broadband to clothes drier..
No. 11 is a first floor flat - one flight of stairs, no lift. You are very welcome to use the large communual walled garden, private and tranquil, perfect for games or relaxing. Local Services: The flat is very easy to find, only 5 minutes from the M2 and 15 minutes from the M25. There are 4 railway stations within 10 minutes and London is only a 45 minutes train journey away. There is a bus stop outside and local services will take you to Chatham (large town), Gillingham (small town), Chatham Maritime (tourism, leisure, marina) and historic Rochester. Brompton High Street is across the road for all the basics - corner shops, chemist, pub, fish and chip shop. There's a library and large leisure centre within easy walking distance. The easiest thing is to get to the Historic Dockyard, Chatham. Travel up Dock Road with the Dockyard on your right and the Royal Engineer barracks on your left. At the roundabout at the top of the hill, take the 3rd exit (which is almost straight over)after about 50 meters you will see Admiralty Gate on your right - a large yellow brick building. There is a right hand turn into the Dockyard, turn in and round so you can come back up to Admiralty Gate. Gillingham is the closest railway station, there are taxis outside. 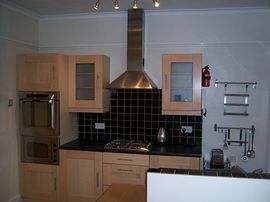 The flat is available for £500.00 per week. Short breaks are £85.00 per night with a minimum stay of 3 nights. Please contact us via e-mail or phone for further information. We are often overseas, e-mail is the best way to contact us. The flat is available from June to September.